Mahou Sensei Negima! Wallpaper: Pactio! Minitokyo »	Mahou Sensei Negima! 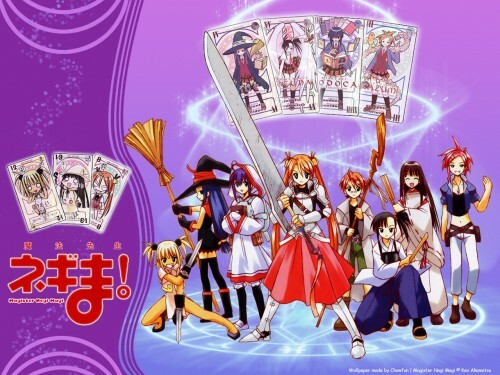 Wallpapers » Mahou Sensei Negima! Wallpaper: Pactio! There are barely any negima walls out there, so as a fan i made my own. It took about 40 layers. The background was simple with some wavy theme to it. The magic circle is supposed to represent the magic circle used int he manga/anime. This wall took a couple of days i hope you like it. I also had to remake a bit of the cards because they had "sanpuru(sample)" writing over them. Browse Mahou Sensei Negima! Gallery: Recent | Popular. Whoa!!!!! Very nice and cheerful wall! the characters in the wall have happy faces and I love every single one of them!!!! Thanx 4 shrin this nice piece of work dear buddie! fantastic wall......but you forgot the signature on Asuna's sword~anyway it's awesome. Awesome i love the colors. And tha background with the hills is sweet. very good! great pic!!!!!! !so COOL!! !xD ooo make more like this and with all the pactio cards! it's so pretty...!! o_____o where did you get the pactio cards from..? Wonderfull! Subarashi wallpaper! I really, really like Negima, even more, I adore it! That's not Negima "squadron" like archangent wrote; it is more like Negi Springfield's SWAT team! I wonder; with a Swat team like he have, will he ever need to rise his wand and make some magic to save the day? Well, maybe, but most like it... not! Konoka will take care of all! REALLY NICE WALLPAPER! KEEP GOING! Beautful! This site is great!